Where family and fun are number one! 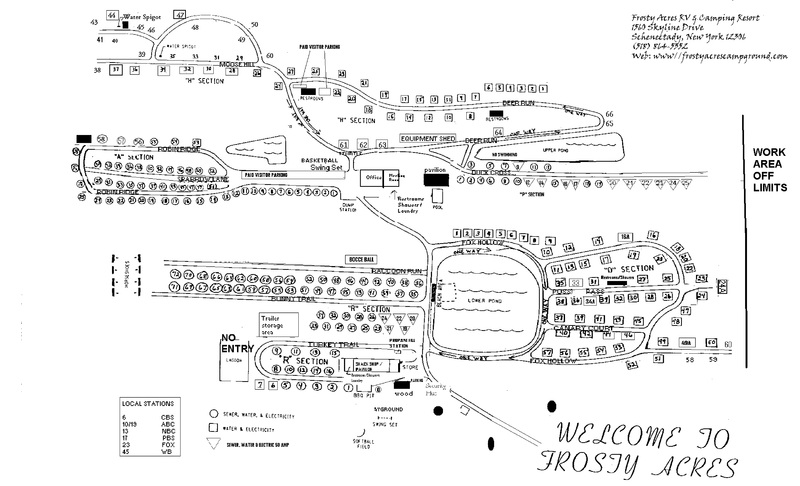 Frosty Acres Campground is nestled in the scenic hills of Duanesburg, New York at 1,250 ft. above sea level. Our campground has a spectacular view for as far as the eye can see on a clear day! Secluded in the hills, away from the hustle and bustle of everyday life. Our refreshing breezes caress the hills and dispel the summer heat. Frosty Acres campsites are spaciously spread across our hills and provides the option of sunny or shaded campsites. Frosty Acres Campground also has a different theme every weekend so you can choose to camp with us on Christmas in July weekend or maybe Halloween weekend. We also have entertainment, check the weekly flyers for all activities and events starting Memorial Day Weekend ending Labor Day weekend. Frosty Acres is a privately owned campground which offers seasonal and nightly camping arrangements. Our camping season runs May though October. All overnight campsite prices include 4 persons total. Children under 5 are FREE. There will be an additional fees for extra Adults and/or Children. Frosty Acres Campground has 50 -amp, 30-amp and 20-amp service, picnic tables and fire rings per site. We can accommodate up to 40+ ft. long by 12 ft. wide including slide outs. If your unit is larger please contact office at (518) 864-5352. Pets are welcomed with a copy of their rabies shot record and on a leash (maximum of three (3). Pet owners are responsible to clean up after your pets. Reservation will be confirmed only when deposit (minimum 1 night) is received, payment methods (Master Card/Visa, or Cash). You must be 21 years of age to rent a campsite.. Cancellations refundable only with 10 day advance notification to park. Check in after 2:00 pm and Check out NOON (12:00 pm). Upon arrival check in at Frosty Camp Store. 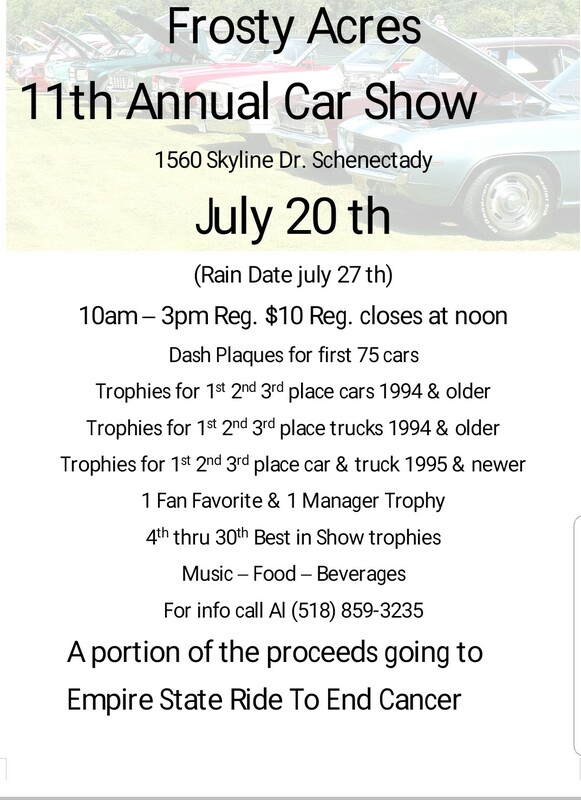 Call for reservations at (518) 864-5352. Events each weekend throughout the season. Please choose directions from the provided options as not all routes will accommodate a trailer. FROM MONTREAL, LAKE GEORGE - NYS Thruway (I-87) south to I-90 west to exit 25A (I-88) to Route 7 directions below. Left onto Route 7 (eastbound) for 0.5 mi. Left onto Route 337 for 0.5 mi. Left onto Route 159 for 6 mi. Left onto North Kelly Road for 0.5 mi. Turn on Skyline Drive for 2 mi.